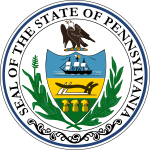 The 1796 United States presidential election in Pennsylvania took place as part of the 1796 United States presidential election. Voters chose 15 representatives, or electors to the Electoral College, who voted for President and Vice President. Pennsylvania voted for the Democratic-Republican candidate, Thomas Jefferson, over the Federalist candidate, John Adams. Jefferson won Pennsylvania by a margin of 1.16%. Greene County's returns, which favored Jefferson, were not submitted in time to be included in the official vote totals. [note 1] As a result, the two highest vote-getting Adams electors received more votes than the two lowest vote-getting Jefferson electors and the electoral vote was split, with 14 of 15 electors casting their ballots for Jefferson. ^ Greene County's returns are included in the grand totals in this article, as well as the county results table. ^ "1796 ELECTION FOR THE THIRD TERM, 1797-1801". National Archives. Retrieved 4 August 2012. ^ a b c d "Pennsylvania Presidential Election Returns 1796". Wilkes University. Retrieved 4 August 2012. This page was last edited on 14 December 2018, at 16:46 (UTC).